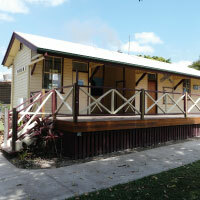 Sarina Art Gallery is one of Mackay Regional Council’s community exhibition spaces. Situated in the Field of Dreams Parkland in Sarina, the gallery is a small exhibition space that is ideal for local artists or artist groups to showcase their talents and works of art to the community and visiting tourists and guests. Artspace Mackay on 4961 9722. Open only during exhibition periods from 10am to 4pm.